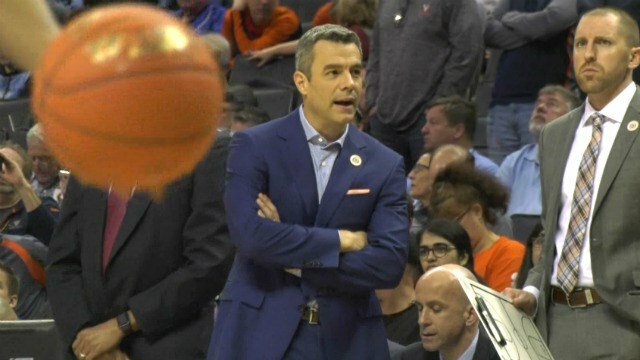 The #2 UVa basketball team will be unable to defend its ACC Tournament title, as the top-seed Cavaliers were upset 69-59 by 4-seed Florida State in the conference semifinals on Friday night in Charlotte, NC. 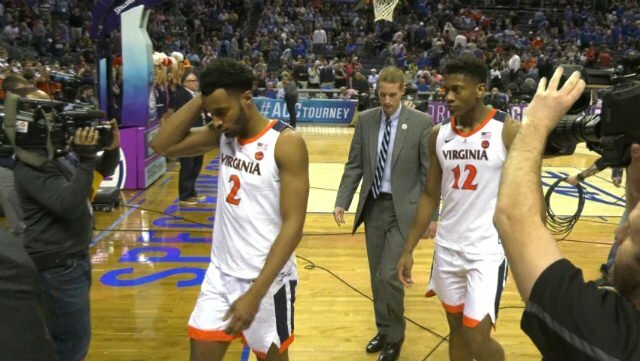 CHARLOTTE, N.C, (WVIR) - The #2 UVa basketball team will be unable to defend its ACC Tournament title, as the top-seed Cavaliers were upset 69-59 by 4-seed Florida State in the conference semifinals on Friday night in Charlotte, NC. Junior forward Mamadi Diakite says, "We didn&apos;t play like Virginia did the whole season. They just out-toughed us, and we paid the price for it." Virginia trailed 35-31 at halftime against the Seminoles. The Wahoos briefly took a 45-44 lead on a Kihei Clark jumper with 13:33 remaining in the 2nd half, but an 18-4 run by FSU gave them a lead they would not relinquish. UVa head coach Tony Bennett says, "These guys have been amazing all year, and we&apos;ve always found a way to pull it out. Sometimes, that&apos;s a good reminder, when you can&apos;t pull it out. We got to tighten the screws in other areas, and be ready. But hats off to Florida State." "I wouldn&apos;t say they&apos;re a better team," says sophomore forward De&apos;Andre Hunter. "I think they played harder than us today. I feel like we played hard, but we had a lot of breakdowns, and things that, if we want to win, just can&apos;t happen." Junior forward Braxton Key adds, "They played a great game. I don&apos;t want to take any credit away from them. Coach Hamilton had his team ready to play today. We kind of knew some things that they were going to do, and they executed them. We just have to go back to film, and execute what we can do to make ourselves better." Kyle Guy was held scoreless in the second half, after pouring in 11 points in the 1st. De&apos;Andre Hunter (13) and Ty Jerome (10) also reached double digits for the &apos;Hoos. "We have three loses on the entire year," says Guy. "Six in the last two years, so I&apos;m nothing but excited for next week." Jerome adds, "It&apos;s going to be painful not to play (on Saturday), but I remember we cut down the nets in the ACC Tournament last year, and we didn&apos;t like the way our season ended, so this isn&apos;t the end all, be all, by any means." Florida State will play Duke ACC Championship game on Saturday night, after the Blue Devils beat North Carolina 74-73 in the other semifinal. Virginia (29-3) will learn its NCAA Tournament fate on Selection Sunday.